The book listing is arranged in reading difficulty order based on Lexile number. Use the key from your early seating course rather than the key below. You will be seated first in this class if we run out of seats. For general seating students, you will be placed in a lottery for any remaining available seats. Use the key below. This course is designed for students in grades 9th-12th but may be appropriate for advanced 7th-8th graders. The course is estimated to take 4 weeks to complete. For the first 2 weeks of this class students will work independently by reviewing the information in the Author, Genres and Historical Background section. They will begin studying the vocabulary words using the Quizlet link that has been provided. Students should also finish reading the book and completing the comprehension quizzes prior to the first day of Live class or prior to watching the recorded AYOP lessons or posting in the discussion forum. This is a longer book, students in live classes may want to begin reading this book prior to the official start date of the class. Students will have approximately 2 weeks during the class to read this book. 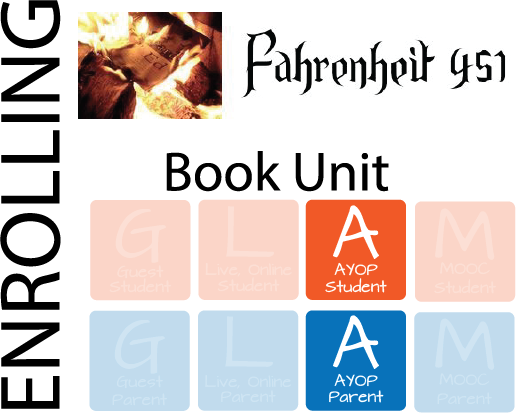 While each of the literature units will vary slightly, all of the units at the middle school and high school level will discuss the plot of the book, themes and symbolism present in the book, the author's background, the genre(s) of the book, it's historical background and how it is relevant to our lives today. Each book at the HS and MS level will also require the students to write a paper in which they analyze parts of the book. In addition to the above, each author has their own stylistic techniques and various books utilize different stylistic techniques and points of view. These topics will be addressed as appropriate for each individual book. Students will be encouraged, but not required, to complete a project of their choosing highlighting this novel or something that took place during the story. This project will be for extra credit and will provide students with the opportunity to express their creativity and individuality. Students are expected to participate in the discussion taking place in the forum in a kind, respectful, and mature manner. Participation forum is required as it is a place for students to discuss the book in greater detail and to share their thoughts and opinions. Students in live classes are expected to attend class and use the chat box to participate in the discussion in a mature and respectful manner. 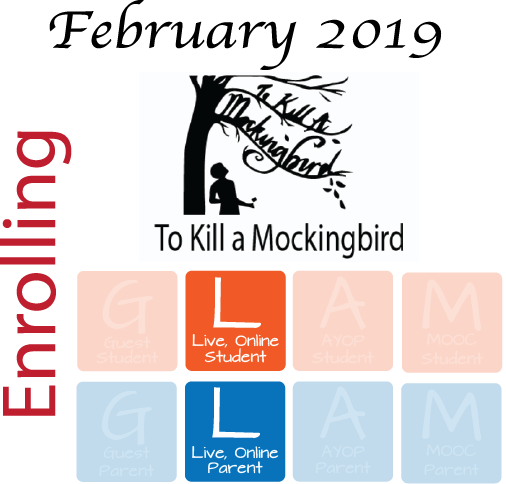 Students are expected to complete the reading assignment before the first day of Live classes or prior to moving on to the ANALYSIS portion on the course page. Students are expected to complete all REQUIRED course work on the course page. Students are expected to think for themselves and share their own thoughts and opinion instead of simply parroting back something they have heard from others. An UNABRIDGED copy of Pride and Prejudice. Links to obtain this book from Amazon.com are provided on the course page; however, this book is often available through used book sites or even from your local library. This course is designed for students in grades 7th-12th. Students will learn about social prejudices present in the American South during the Depression. They will be shown this world through the eyes of a young girl named Scout and challenged to apply the lessons taught through this book to their lives today. Each book at the HS and MS level will also require the students to write a paper in which they analyze parts of the book and students will be asked to express their opinions in various discussion forums. A copy of To Kill a Mockingbird. This course is designed for students in grades 5th-8th. The course is estimated to take 4 weeks to complete. It is recommended that students begin reading the book prior to the first day of class. They will have approximately 2 weeks of class time to finish reading the book. Students will complete comprehension quizzes over the reading, study a vocabulary lit, view information on the author and background of the book, learn about some of the literary devices used in this particular novel, participate in discussion forums sharing their thoughts and opinions with fellow classmates and complete an essay showing their understanding of the material covered in class. Students have the opportunity to complete an extra-credit project of their choosing. The sky is the limit. 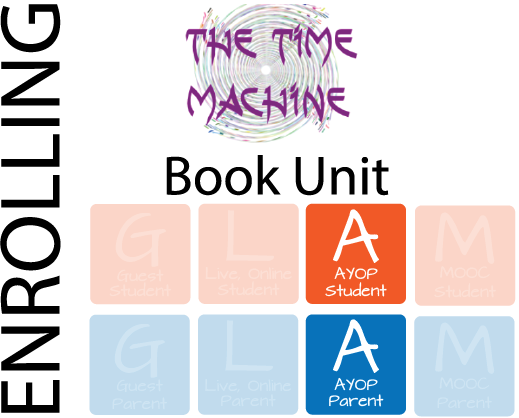 While each of the literature units will vary slightly, the book units will discuss the plot of the book, themes, and symbolism present in the book, the author's background, the genre(s) of the book, it's historical background and how it is relevant to our lives today. Each book has a required writing assignment allowing the students to show that they understood the information presented in class or in the AYOP lessons. Each author has their own stylistic techniques and various books utilize different stylistic techniques and points of view. These topics will be addressed as appropriate for each individual book. Students are expected to complete all REQUIRED coursework on the course page. This is a fairly short book. Students will have 2 weeks during the class to read this book, but may begin reading this book prior to to the official start date if needed. The course is estimated to take 4 weeks to complete. This is a fairly short book; however, students in live classes may want to begin reading this book prior to the official start date of the class. Students will have approximately 2 weeks to read this book prior to the first live class. during the class to read this book. 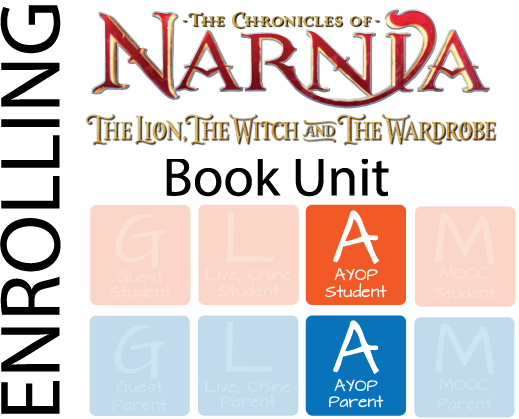 While each of the literature units will vary slightly, all of the units at the middle school and high school level will discuss the plot of the book, themes, and symbolism present in the book, the author's background, the genre(s) of the book, it's historical background and how it is relevant to our lives today. A copy of The Time Machine. Links to obtain this book from Amazon.com are provided on the course page; however, this book is often available through used book sites or even from your local library. An UNABRIDGED copy of Sense and Sensibilities. Links to obtain this book from Amazon.com are provided on the course page; however, this book is often available through used book sites or even from your local library. This is a fairly short book and students are asked to review the Author, Background, and Genre information before beginning to read the book as it this information is critical in helping the students understand the meaning of this book. Students will have approximately 2 weeks during the class to read this book and do need to finish reading it before the first live class meets or before beginning the ANALYSIS section of the course. A copy of Animal Farm Links to obtain this book from Amazon.com are provided on the course page; however, this book is often available through used book sites or even from your local library. The course is estimated to take 4 weeks to complete. Students shoud begin by reviewing the information in the Author, Genres and Historical Background section. They will begin studying the vocabulary words using the Quizlet link that has been provided. Students should also finish reading the book and completing the comprehension quizzes prior to watching the recorded AYOP lessons or posting in the discussion forum. A copy of Fahrenheit 451. Links to obtain this book from Amazon.com are provided on the course page; however, this book is often available through used book sites or even from your local library. The course is estimated to take 4 weeks to complete. Students should review the information in the Author, Genres and Historical Background section. They will begin studying the vocabulary words using the Quizlet link that has been provided. Students should also finish reading the book and completing the comprehension quizzes prior to watching the recorded AYOP lessons or posting in the discussion forum. A copy of The Lion, the Witch and the Wardrobe. This book is often available through used book sites or even from your local library. The course is estimated to take 4 weeks to complete. Students should begin by reviewing the information in the Author, Genres and Historical Background section. They will begin studying the vocabulary words using the Quizlet link that has been provided. This class meets for a total of 4 live sessions. You can choose to meet once per week or 4 weeks or meet 2x per week during the last 2 weeks of the month. Teachers should read the book prior to the first live class. Slides and teaching notes are provided. These should be reviewed prior to teaching each class. Teachers are welcome to grade the student's work or to request grading help. Contact Mariah Fustos (paulmariah@aol.com) with questions. Both the live and AYOP classes will require graders to grade 1 paper per student using a detailed rubric. Graders (and teachers) are asked to comment on the papers that they grade in the "feedback" section. The discussion forms are "rated" by graders. The rating system is located in the directions of the forum and is the same for most courses. Graders for the AYOP couses are encouraged to occasionally comment on what the students are saying in the forums. Students have the option of completing a creative project, for extra credit. These would also need to be graded. Everything else is graded by Moodle.